Because of the new emphasis placed on cheap fares and reduced services after deregulation, the legacy airlines risked alienating customers who had willingly paid higher prices for niceties. Some therefore sought to publicize options for passengers who wanted to continue receiving those niceties at those higher prices. 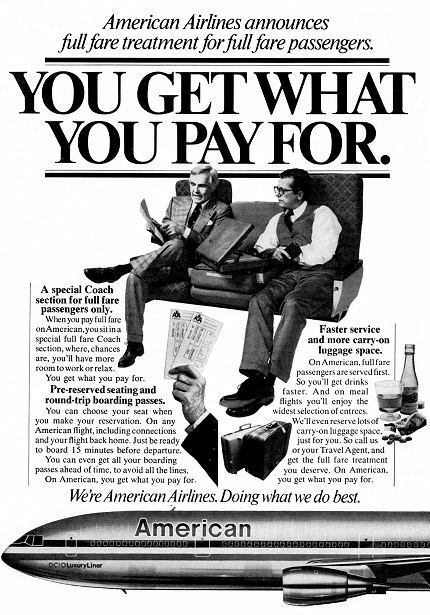 American’s “full fare” coach section actually offered very few additional services, mostly giving passengers with full fares the opportunity to avail themselves of the same coach services first, but legacy airlines did not want to give up easy money from business travelers, and therefore eagerly offered whatever they could to please all different types of passengers. 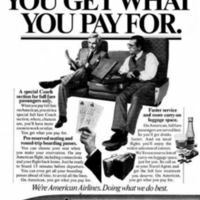 American Airlines, “You Get What You Pay For,” The American Century, accessed April 20, 2019, https://americancentury.omeka.wlu.edu/items/show/388.